The length of this piece is over 24 inches, not including the 3 inches of chain at the clasp, for added versatility. 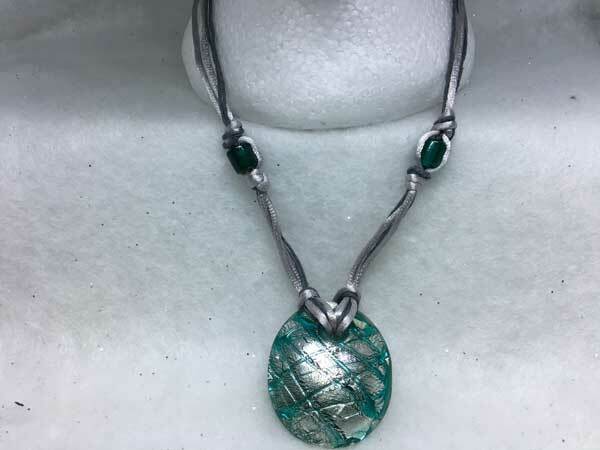 The focus of this necklace is a large, beautiful round glass foil pendant in teal and silver. It is a heavy, concave piece. I have complimented it with silver satinique cord along with darker charcoal hemp cord. Further up from the pendant, I have threaded 2 teal glass barrel beads that coordinate nicely with the pendant. The satinique cord is wonderfully soft and will feel great on your neck. It is finished with a lobster claw clasp and, as stated above, 3 inches of added chain to give you lots of varying length, depending on how you want to wear it.